“Thank you Alan Knott-Craig!” may be a strange statement coming from the CEO of MTN South Africa, but these are the exact sentiments shared by Zunaid Bulbulia, their new Chief Executive, as we sat with him discussing leadership and the opportunities and challenges facing him while filling that office. This particular statement came on the back of our question of what Knott-Craig and Cell C have brought to the South African mobile telecoms market, a question we also posed to Shameel Joosub a short while back. Bulbulia shared that he has great respect for his competitor because he is such an experienced campaigner in their industry. Bulbulia and his team have had to make sure they are working harder and with greater focus than ever before: “…we’re learning to make decisions quicker, we’re learning to be more market aware, and we’re learning to not take them for granted. Alan knows the industry – he’s not a guy that parachuted in here and doesn’t know anything about South Africa. The unintended consequence for Alan is that he’s made us, and Shameel Joosub at Vodacom even more determined to be successful… and he’s made me more match fit.” This is the invaluable contribution that competition offers the market place and consumers. Zunaid Bulbulia is one of only two who remain of the original group of seven who were there at the birth of our familiar yellow telecommunications company, MTN. He has devoted 19 years to assisting it to move from a start up to a small company of 200 to 300 staff members and 50 000 customers, to an organisation which today is a multinational player whose reach extends into 19 different countries in Africa, Europe, and the Middle East and now employs well over 17 000 staff members, supplying services to over 189 million customers. He would later go on to study accounting and qualify as a charted accountant having completed his articles with the then highly regarded Arthur Anderson. And this journey no doubt naturally prepared Bulbulia as a leader and positioned him well for his role as Chief Executive of MTN South Africa. Many leaders, but not all, undergo a natural process of shifting from seeing themselves as a technical, functional person to becoming a leader by profession. Let me explain: Years ago, we published our first book entitled “The CEO Leadership Handbook”. Having been quoted therein, Roy Anderson who was the CEO of Liberty at the time asked for a copy. He explained why: “Years ago I realised I’m not a Chartered Accountant anymore, I’m a leader, that’s my profession.” Anderson had made a conscious shift in his mind and if someone from his distant past asked what he does or what he had become he would have told them that he was a leader, not a CA. Often top executives don’t make this conscious shift and still see themselves as specialists in their area of vocational studies. They may barely use these technical skills but remain devoted to the notion that they are still those people. As a result, many do not improve their leadership skills actively enough. In questioning top leaders regarding this, most have to admit that their day to day functioning requires maybe 10% specialist, technical knowledge while the remainder of what they are needed to do requires a 90% leadership skill set to be employed. In order to effectively create movement leaders need to provide their followers with a clear, concise strategy that is going to lead them to realize their goals. However, this cannot be done without first simplifying the situation by having a solid hold on all the facts and an understanding of the teams/organizations strengths and weaknesses within these facts. Bulbulia has an interest in and a natural instinct to analyse, scrutinize, and demystify situations where there previously existed vagueness, ignorance and even complexity. Not only does he describe his leadership role as needing to provide clarity and insight, but he also seemed to have the courage to take on projects even where he had no or little background or training. No doubt these initiatives moved forward successfully partly because of his natural and then further developed ability to simplify, clarify and give direction. He explains: “…every time something looked vaguely interesting and they were looking for someone, I put my hand up and said I’m happy to give that a bash. With the result that I did things that had nothing to do with what I had studied at university for the longest time. 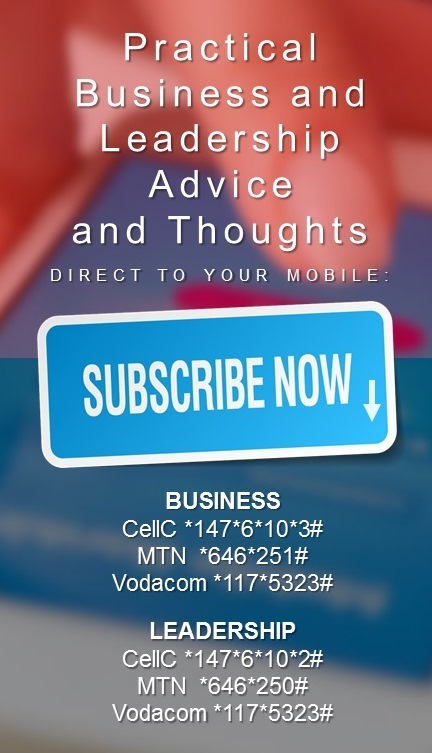 In fact, even when I became CFO of MTN SA, I did very little accounting, because the accounting strategy had been created and I was focusing more on running the business with Carel and the rest of the guys. Bulbulia calls it being a “go to guy”, which he believes he became because of always volunteering. He says “go to guy”, we say leader. His continuous leadership journey will no doubt accelerate as he consciously views himself as a leader, which will be important as he leads the “new” MTN. Leading an established business like MTN means you no longer ride that original exciting tidal wave of growth. It seems less exciting than before. Structures and systems are in place; growth opportunities are perhaps limited. One understands that they are moving from voice to data, but is it still so interesting and exciting to be at the head of MTN SA? In fact their entire context has changed because they are no longer just a mobile company. They are many different things to many different people. The exciting journey according to Bulbulia is one of making the cell phone device the centre of people’s universe. Also, “becoming a service company is now a challenge – we’re not a service company, we’re a growth company, we sell and move lots of product, but can we become a damn good service company where people say when I think about MTN I think about the most unbelievable service. It’s a huge journey,” explains Bulbulia. Admittedly this is a huge culture change for MTN and employees need to get used to this new context. An interesting leadership challenge. In an industry with so few players, where technological changes occur at breakneck speeds, and competition is extremely high, the difference may very well come down to which leader is more “match fit” and positioned in such a way to understand where to next create movement. Interestingly though, Zunaid Bubulia is the man at the MTN SA helm and, like the other competitors MTN seems to be in good hands. This makes for interesting times ahead in this industry, with the ultimate beneficiaries being us the consumers – nothing wrong with that. BRLP: We know you try to remain physically fit but how do you remain leadership fit? ZB: Yes, I try to remain physically fit. I’ve been cycling for let’s say 10 years now. I’m not pro, but I’m a pretty good amateur cyclist. I do the 94.7 in less than three hours which is quite decent. I’ve taken to running in the last couple of months. I ran the Comrades for the first time this year, which was a fascinating experience. I ‘m hoping to do Iron Man next year. I’m increasingly learning to remain leadership fit by remaining in the now and remaining resourceful, by knowing that by remaining in my present context I can make a difference. The future – sure I can help shape the future – but it’s not happening now so I really can’t do much about it. The past has happened; there is not much I can do about that either. But remaining resourceful and in the now I can be very very effective in how things may be operating or working currently. BRLP: If there’s one thing we’ve discovered over all these years of interviewing hundreds and working with thousands of leaders, is that what they have in common, is that they have created movement. People often try position leaders as having the same attributes and skills and personality traits and whatever it may be, but actually what they have in common is that they have created movement. So here you are – you have now been asked to move MTN from where it is to something better. Where do you want the business to move to and how happy are you with the movement that’s happening at the moment, as a leader? ZB: There are two areas of movement I want to create in this organization. There’s a need for us to become the number one service company in South Africa, not just in our industry. I do want us to become synonymous with service. The sustainable benefit of that goes well beyond just being able to grow revenue faster than you are growing costs. It’s about people wanting to do business with MTN and wanting to be a customer of MTN because the experience is so good. I think the multiplier effect it has on your bottom line is phenomenal if you can position yourself and sustain yourself as a top service company. Becoming that company is going to require enormous movement, because I don’t believe we’re anywhere close to that at this point in time. We are a company that knows how to manage growth which is exponential. So that is the first bit of movement that I want to create – a very real movement to becoming number one in service. The second is I want us to be able to sustainably grow faster than our competitors along all the key areas of our business, whether that’s in revenue, in profit, in market-share, in brand awareness, in social responsibility, across all the key metrics that make a business successful. We’ve had periods where we’ve been ahead of them; we’ve had periods where they’ve been ahead of us. It’s almost been like watching a Formula One race and on every lap someone else takes the lead. I will feel we would have created meaningful movement if we are able to sustain over a long period of time consistently beating our competitors across all the key metrics in our business. That’s the challenge I’ve set for myself and for my team – to find the formula and the way of work that results in that movement. BRLP: The world has changed, the world is changing – what three skills would you say are necessary for future CEO’s of MTN to develop now and in the future to ensure that the movement you are looking for will be sustainable? ZB: Leadership traits/skills that will be important – I think being visible is a key element of the skills that will be required. I think we have a very strong element of invisible leadership in MTN, not just in MTN, but in this industry. We’ve always been just too busy to make the time to be visible, never mind the outside world, but even to our people inside the organization. So yes, becoming more visible to our people and to our customers. I think accessibility is a key one – again under the mask of growth we’ve been not seen, not heard, too busy crafting the way forward, managing the growth. And above all I think is probably humility. I think this industry has become arrogant, we’ve lulled ourselves into believing we are the success story that the JSE says we have become, but which can be taken away from you overnight because something happens from a regulatory point of view or the economy doesn’t perform in a certain way. I think humility breeds in you a very strong desire to find ways to continue to be successful. We’re not a humble industry and becoming humble will give us the ability to remain grounded in order to know that tomorrow’s future is not guaranteed. I know that more now than I knew it 6 months ago, because things have changed in our industry in the last 6 months. Just A Bad Month For Leadership In South Africa – Or An Alarming Norm?